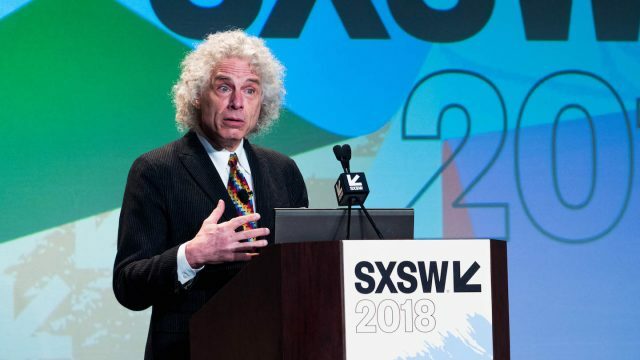 New York Times bestseller and Johnstone Professor of Psychology at Harvard Steven Pinker spoke to the SXSW community in March about the ideals of the Enlightenment period and used data to exemplify the social progress that has occurred in the 250 years since. The session begins with a presentation of the various metrics for measuring quality of life of populations, represented in graphs that illustrate a steady improvement over time. These graphics lead to the inevitable question of the session — if we can statistically demonstrate that now is the best time to be alive in recorded history, then why are we so pessimistic as a society? Of course, there is no simple answer to how this pessimism has developed nor an easy fix for it, but Pinker’s presentation lays out the argument that society has progressed over time. “A narrative that progress is possible but not inevitable has to be part of our understanding,” said Pinker. This statement is central to his presentation — that we cannot assume that living conditions will always improve without deliberate action to make it so. Learn more about the ideals of the Enlightenment period, the pitfalls of backsliding as a society, and the possibility of progress in the full SXSW 2018 session, “Enlightenment Now: Reason Science Humanism Progress,” from the Intelligent Future Track at the SXSW Conference.